SALT LAKE CITY — The man in charge has stayed patient as he has explained concepts to a young group that still needs time to fully grasp them. He has displayed his appealing personality by treating everyone as equals, empowering his players with positive reinforcement and offering good-natured teasing. 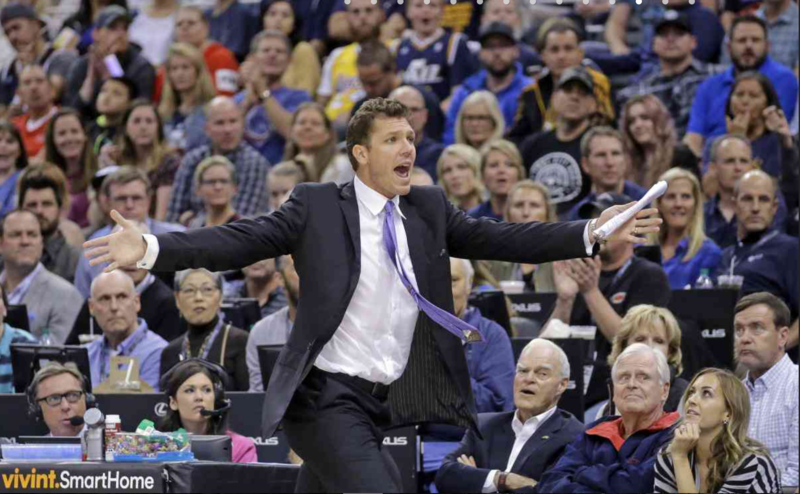 But for all the approaches Luke Walton’s upbringing and coaching style has mirrored Phil Jackson with his calm approach, Walton has emulated one of his mentors in another way. Walton did not hesitate in offering honest critiquing toward the officiating in the Lakers’ 96-89 loss to the Utah Jazz on Friday at Vivint Smart Home Arena. First, Walton narrowed in on the Lakers committing 29 fouls that resulted in the Jazz going 28-of-40 from the free-throw line. Walton has decried the Lakers’ high foul volume in training camp, but Walton’s frustration pointed more toward the men in the black and white shirts than his players still learning defensive concepts. Walton then questioned why officials retroactively discounted a Jordan Clarkson 3-pointer in the third quarter after a review of the play showed he stepped out of bounds. The Lakers’ play in question appears to be a unique circumstance. The play took place in the third quarter, not at the end of the game. Though officials can look at any play to determine a possible discrepancy between a 3-pointer and a jump shot, the rulebook does not suggest they can retroactively determine an out-of-bounds play. Jackson often questioned officials, particularly before and after playoff games, both to deflect criticism toward his players and to pressure officials on how they will handle their whistles in future games. Yet, Walton stressed that “Utah earned that win” and described the Jazz as “well coached.” Walton also decried the starters poor chemisty, which included going a combined 15-of-44 from the field. Walton also cleared his bench early in the third quarter because of the starters’ lack of energy to open the second half. But just as Walton defended his players for sparking so many whistles, those same players criticized themselves for how they reacted to them. Lakers forward Julius Randle and Lakers center Timofey Mozgov both collected technical fouls, which will result in each paying a league-imposed $2,000 fine. It’s not clear what prompted Mozgov’s technical. But Randle received feedback after politely pleading his case to officials. That also happened to be what dominated most of the talk in the Lakers’ locker room. As much as Russell provided positive reinforcement to Randle as they walked off the floor, the Lakers’ second-year guard looked down as he sat by his locker. After lamenting the calls, Lakers forward Luol Deng soon approached him and started providing undisclosed feedback. The Lakers almost did before falling short at the end. Moments later, Walton spoke the thoughts many of his players harbored on the officiating. Walton will soon find out if the method works to his advantage as it once did for Jackson.